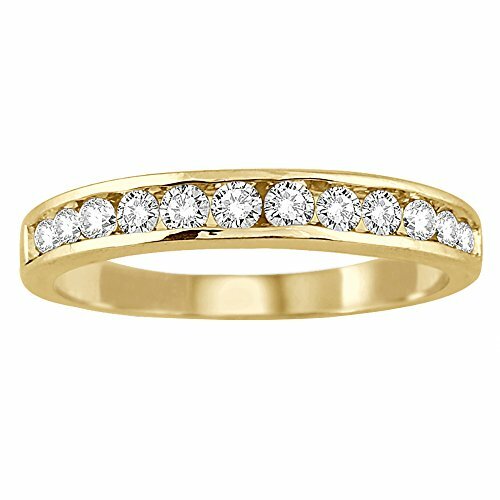 Sparkling diamonds, channel set on this simple yet classic band crafted in 10K yellow gold. A masterfully set ring perfect if worn alone or as a matching band to an engagement ring. The number of diamonds vary between 11 and 13 stones based on the exact stone and ring size during setting. The ring is accompanied by an independently graded AGS (American Gem Society)Laboratory evaluation report certifying diamond quality. If you have any questions about this product by Szul, contact us by completing and submitting the form below. If you are looking for a specif part number, please include it with your message.